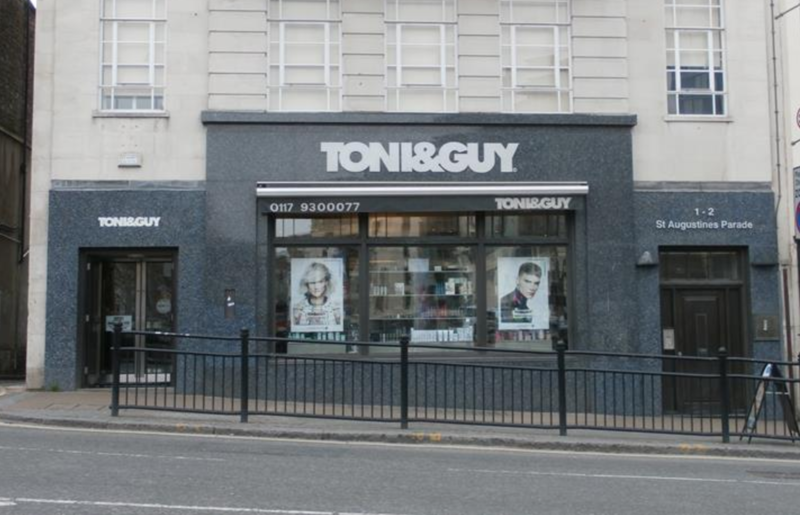 About TONI&GUY Bristol Located at the bottom of Park Street, one of Bristol’s most fashionable shopping areas and home to some of the city centre’s most popular bars and restaurants, as well as just a few doors away from The Hippodrome the salon is ideally situated. With its modern design and highly talented team you’ll be guaranteed the ultimate TONI&GUY experience! We have been successfully running the Bristol salon since 1998. Together with our experienced team of stylists and technicians, we are dedicated to providing clients with the highest level of service in a relaxed environment. Whether you are looking for a new style, colour, extensions, professional product range or simply require some hair advice, you can depend on us to make your hair look & feel fantastic! PARKING Trenchard Street Lodge St, Bristol, City of Bristol BS1 5AN OR Millenium Square @ Bristol Car Park located at Bristol BS1 5LL SOCIAL MEDIA Follow us on Facebook - CLICK HERE to go to our page TONI&GUY HAIRSPA Bring out the best in your hair and wellbeing with the indulgent TONI&GUY HAIRSPA. We have six hair and scalp restoring in-salon treatments available. Hairspa has been designed to target your specific needs, whether it’s a deep condition to nourish your dry hair or a revitalising scalp treatment. Using expert head massage techniques combined with the award-winning label.m professional haircare range and hot towel wrap; you will feel and notice the improvement instantaneously. With tailored aftercare available to take home, you will continue to benefit from your treatment until your next appointment. RELAXATION HEAD MASSAGES Invigorate – a revitalising scalp treatment for all types Moisture – deep conditioning treatment for dry hair in need of extra moisture Rejuvinate – a replenishing hair therapy for dry, weak and dull hair TARGETED TREATMENT HEAD MASSAGES Soothe Treatment – relieves inflammation and itching associated with scalp conditions or irritation from a colour service Repair Treatment – repairs, smoothes, replenishes and provides inner strength for very dry and damaged hair Colour Protect Treatment – revitalises healthy texture and shine and locks in colour to repair colour damaged hair If you and your hair deserve some extra special attention, call the salon to book a free expert HAIRSPA consultation today. Strength in Style Strength in Style is now available in this salon, offering people affected by cancer specialist support and advice on hair care. This service includes styling pre, during and post treatment hair, and wig personalisation with the option to purchase synthetic and human hair wigs. Please contact our friendly reception team for more details. As always Nicole greets you with a smile & makes you feel very welcome. She listens to what you want, adapts it to your hairstyle & voila you go out the door feeling a million times better than when you walked in. Thank you Nicole for being you ! Five star service on all the catagories. Nicole is great at cutting hair and gives very helpful hair guidance, and is very focussed on helping you get the result you want! Also when you walk into the salon all the staff are very attentive / helpful. Both people at the desk were on the phone to customers when I arrived (being very helpful to them too) and someone else from the floor immediately noticed and came to help me, all whilst sitting 3 different people down and getting them drinks/ taking their bags / letting stylists know who had arrived. Very impressed with all aspects. As always with Marie - I go into the Salon looking a wreck and leave with model locks. The best scissor hands of all time. If I win the lottery, the one thing I won’t be changing is my hairdresser! From the moment you step in to the salon you are attended by thoughtful, efficient staff who make your visit a total experience. Your stylist will listen, engage with you and send you away feeling better on many levels. Brilliant service from the moment I walked in to the salon! Looked great when I walked out! Felt bad because I was absolutely shattered and hardly said a word, but she knew exactly what I wanted and my mum even wants to book hers in after seeing my hair. Love it and would like to make regular visits to keep on top of my hair with charlotte. Kim has yet again coloured my hair to perfection! It's so easy to relax and enjoy my time at this salon because I know I can always be confident in the results. James cuts my hair and having used this salon for 20 years, I don't need to say much more than, do what you think and he does, and it's always great. Fabulous as always! Very happy with haircut and way dried and curled. Also had a colour test done. Very happy with whole experience. Will 100% return. Thank you Jade. Lovely to have Rosie back again. She is a very skilled stylist and I am very happy with the cut she gave me on Saturday. Thank you Ben for cutting my hair while Rosie was away. Another excellent stylist. The cut is ok as a cut, but not what I asked for. The styling seemed a bit cursory and rushed. The stylist was rather abrupt in her manner.